GenderFun.com: Could I or Someone I know be Experiencing Gender Dysphoria? 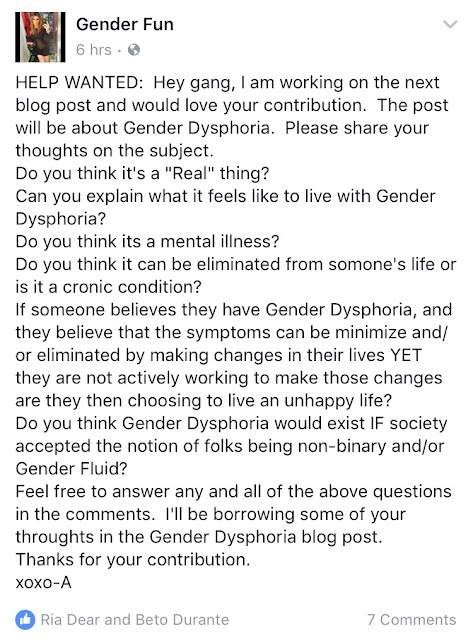 Could I or Someone I know be Experiencing Gender Dysphoria? At one point in your childhood you came to the realization that most, if not, ALL boys don't wear skirts. At another point in your childhood you came to the realization that, anatomically speaking, boys and girls are different. Some parents/guardians/teachers stop boys from being in touch with there emotions by telling them emotionally damaging things such as "boys don't cry" as shown in the documentary "The Mask You Live In." While we try to convince ourselves AND girls that they are naturally TOO emotional. This we call Gender Policing. For most of us these two realizations combined with Gender Policing means that we put people in two categories Male and Female, and we MUST put OURSELVES in one of either Gender category (Gender Binary) as well...but for some of us having to be in the Gender category assigned by our society or being in ONLY ONE of these two Gender categories causes us a great deal of STRESS. We didn't want to grow up a boy and become a "man" or we didn't want to grow up a girl and become a "woman." Some of us told our parents of our discomfort with this Gender Binary system and the disconnection we felt to our bodies at an early age while many if not MOST OF US kept it a secret and pushed it deep down and to the back of the closet. Generally speaking, that feeling, that stress, we are talking about has been given a name; Gender Dysphoria. At this very moment any member of YOUR family could very well be struggling with some level of Gender Dysphoria and you wouldn't even know it. Folks with Gender Dysphoria are masters of hiding how they truly feel in life. Some folks are pros at putting on a smile during the stressful times. That is a survival skill we learned. Another realization we had as a child is that when it's time to take the family photo portrait we ought to SMILE and LOOK HAPPY even if deep down inside we are sad. Some of us see it as a emotional "sacrifice" for the greater good. We sacrifice our self expression in order to maintain the "peace," or at least we convince ourselves that THAT is what we are doing. But suppressing any emotion acts like a pressure cooker, the more it is suppressed the more it wants to bubble-up to the surface or explode in time like it did with Madison Holleran. Unlike Madison Holleran, may she rest in peace, our lives don't have to end in suicide. We can learn to express ourselves and work hard to find and create environments where we are accepted for expressing how we feel deep down inside. We recently asked the Gender Fun community on our Facebook page to share their thoughts on Gender Dysphoria. Gender Dysphoria is a REAL FEELING. 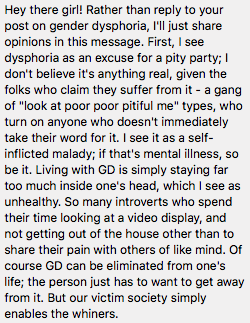 Yes, there will be people who say that Gender Dysphoria is simply an EXCUSE some folks use to not fully come out of the closet about how they truly feel in Life. In our humble opinion, at the end of the day it all comes down to how you feel about expressing your TRUE emotions regardless of this Gender Binary world you were born into. It takes a lot of courage to DEFY THE CURRENT SYSTEM by piercing your ears and growing your hair long if you were assigned male at birth or growing your arm pit hairs and leg hairs if you were assigned female at birth. Once you realize that Gender Dysphoria is a social decease that most societies are suffering from, and passing down to generations, you will become one step closer to the freedom from the Social Gender Prison you were born into. The Gender Veil has been lifted, we all see the Gender oppression happening in our times. It is NOW that we HEAR THE CALL TO ACTION to put a STOP TO THE GENDER DEVIDE. 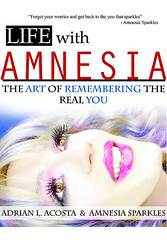 In the next blog entry I will lay out my personal action plan to combat Gender Dysphoria.